I haven’t painted anything for 5-6 months….life has been difficult. My daughter had major surgery in December and is due for some final surgery soon. My mother also passed away early in the year….so there’s been a lot to deal with. This week I felt inspiration rising again, after this great period of grief and distress, and have been able to take up the brush. 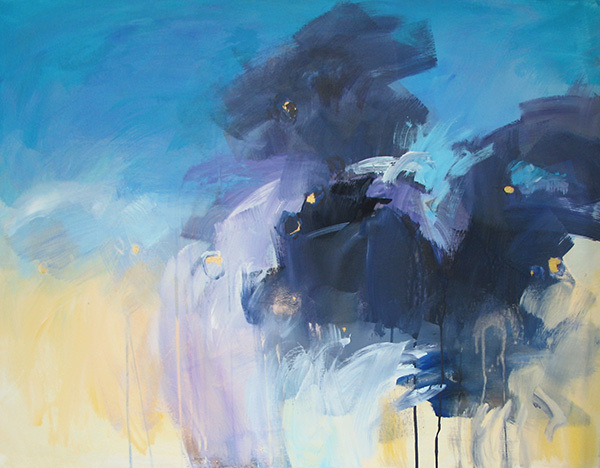 I started 2 works and have completed one, dealing with memories of the Australian summer and the powerful presence of the light and colour experienced in our coastal areas. “Byron trilogy: water, sky, beach” features dominant colours of yellow and blue, and spontaneous brushstrokes reflect the immediate experience of the coast at Byron Bay: the ocean and beach in vivid hues. It’s a joyous expression after a personal time of turmoil. The latest of my Alchemy series is complete today, and so I’m posting it up for you to enjoy. It’s titled “Beach treasures from the oceanic mind” and once again explores the deep hidden areas of psyche moving into light; the painting acts as a metaphor for my own inner process, but also as an external process in the real world, whereby blobs of coloured paint are transmuted into an artwork. Note the tiny specks of gold; another reference to alchemy. This painting’s quite bright in colour over much of the surface and is reminiscent of beach sand…the title speaks of this too. Just as we may find tiny treasures on the sandy shore, similarly we may find hidden treasures within our personalities.